We know that conspiracy theories may have some important negative societal consequences. Conspiracy theories can discourage people from engaging with the political system, taking action against climate change and having a fictional child vaccinated. In each of these empirical investigations, participants were exposed to conspiracy theories, before being asked to immediately complete several questionnaires – such as their intention to vaccinate a fictional child after they had been exposed to anti-vaccine conspiracy theories. An intriguing question remained, however: How long do these effects persist for? Recent research published in the International Journal of Communication has provided some answers to this. The scholars found that after exposure to a video promoting government conspiracy theories about the moon landing (segment taken from Conspiracy Theory: Did We Land on the Moon), belief in conspiracy theories increased immediately after the exposure and two weeks later (when compared to people who had not watched the video). This provides, to my knowledge, the first empirical evidence that being exposed to conspiracy theories can change your attitudes for a prolonged (two-week) period of time. If you are interested in reading the paper, you can access a PDF copy here. 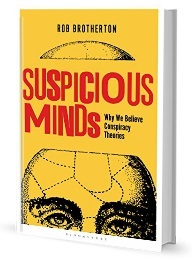 As a scholar examining the social consequences of conspiracy theories, I find this research particularly intriguing as the research provides evidence that conspiracy theories may indeed endure for a longer period of time than the experimental session. There are however still unanswered questions, such as whether being exposed to conspiracy theories would also change behaviours over a period of time, and of course, whether the effect persists after two-week. Yet, this empirical investigation adds to our understanding and highlights the importance of further investigations into the psychology of conspiracy theories. JUST BRING ALL OF US CONSPIRACY FOLKS OUT, AND WE WILL MAKE SENSE OUT OF THINGS THAT NEVER MADE SENSE AT ALL. YOU MAY NOT COUNT ON ANYONE ELSE, BUT YOU SURE AS HELL CAN COUNT ON US. WE WILL THROW OUT THE BAD GUYS, AND KEEP THE GOOD ONES. WE MAKE NO COMPROMISES. DIRECT AND VERY MUCH TO THE POINT. What I’d like to see is some research about the connection between believing in conspiracy theories and the Caps Lock key. Futuret seems to be a cooked out hasbara-style Uberconspiracy-bot. Google — “futuret says:” wordpress— and you’ll find an incredibly prolific and cross-posting troll. Very interesting.